Frank Capra’s indelible brand of feel-good morality tales, sprinkled with romance and humor, has led to his films being labeled as “Capra-corn” by some critics. And it’s true that some of his most beloved and well-known movies tend toward the sentimental. But to deride Capra’s work as mere schmaltz is to ignore the sheer talent and craftsmanship that drove each of the director’s creations. Though the perennial Christmas classic It’s a Wonderful Life (1946) is perhaps Capra’s best-known film, it is by no means his greatest. 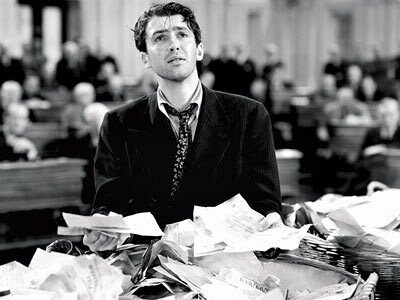 In my mind, that honor belongs to 1939’s Mr. Smith Goes to Washington, a patriotic, heartfelt American celebration featuring one of Capra’s most effective casts, including James Stewart, Jean Arthur, and Claude Rains. Stewart stars as Jefferson Smith, a young, idealistic leader of the Boy Rangers, who is tapped to replace the recently-deceased junior senator of his state. 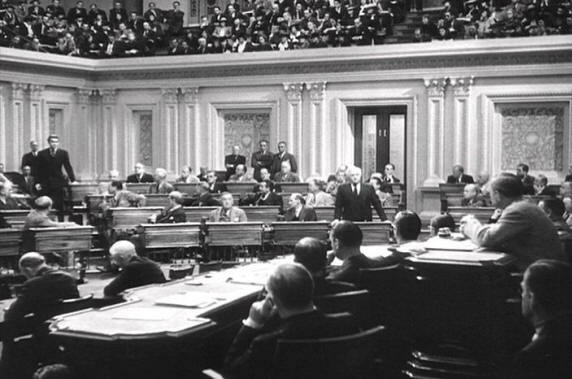 The head of the state’s political machine, Jim Taylor (Edward Arnold), pressures the state’s senior senator, Joseph Paine (Rains), one of Jeff’s heroes, to keep the young man in line to ensure that Taylor’s political schemes remain in play. Paine tries to distract Jeff with his alluring daughter, Susan (Astrid Allwyn), and convinces Jeff to sponsor a bill in order to keep him busy. Jeff’s secretary, Clarissa Saunders (Arthur), who is initially skeptical about her new boss’s ability to do his job, is eventually won over and assists him in crafting a measure to build a national boys’ camp on some land near Willet Creek in his home state. However, unbeknownst to Jeff, Taylor has his eye on the same property, and has buried the graft in a Public Works bill being supported by the crooked Paine. When the Taylor machine goes to work destroying Jeff’s credibility, he takes over the Senate floor via filibuster in an effort to convince his fellow senators–and his constituents–that there are corrupt forces at play within the government. This movie is, for all intents and purposes, a political fairy tale, wrapped up neatly–and somewhat unbelievably–at the end. Are we to believe that Paine, a seasoned politician with years’ worth of political shenanigans under his belt, is so moved by Jeff’s efforts that he first attempts suicide, and then confesses the entire scheme? It seems too far outside the realm of possibility to be realistic. And yet, we believe anyway. This is a grown-up fairy tale, and one that those of us who have become jaded by “politics as usual” wish could come true. How different would our government be if all politicians believed as Jefferson Smith does–that liberty is both our right and our privilege, and that it is their sacred duty to uphold that construct on behalf of all of us, the forces of corruption be damned? Smith shares several themes with the aforementioned Life, the most prominent of which is the notion that one person has the ability to make a difference in the world. But Life has a more cynical take on man’s existence than does Smith; amidst the subtle digs at government corruption and the political machine, there is an innocence to Jefferson Smith that Life’s George Bailey decidedly lacks. It’s fitting that both roles are played by Stewart, the everyman to beat all everymen. We believe Smith–believe IN Smith–because of Stewart’s very capable and passionate portrayal, and we feel for him and his fight as much as we feel for George’s despair in the latter film. Stewart was nominated for an Oscar for his role as Jefferson Smith, but lost to Robert Donat for Goodbye, Mr. Chips. He went on to win the Academy Award for Best Actor the following year for his performance in The Philadelphia Story–an award many in the industry felt was not so much for his comedic turn as Macaulay Connor in that film, but as an overdue recognition of the brilliance of her performance in Smith. 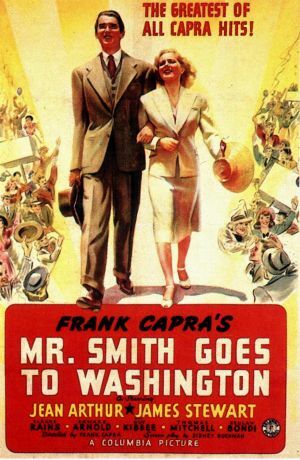 This film also marks one of Jean Arthur’s best roles as the street-smart Capitol Hill insider won over by Jeff’s corn-fed “hokum.” Arthur is sometimes overlooked in the annals of film history–for instance, it remains inexplicable to me how AFI could list the supposed “25 greatest film actresses” and NOT include Arthur–and to modern audiences, she is not among the more well-known film legends. It’s a shame more people aren’t familiar with her work, because Arthur was a truly great actress. More known for her comedic roles, particularly her deft hand at screwball comedy in films such as 1937’s Easy Living and her two previous films for Capra, Mr. Deeds Goes to Town (1936) and You Can’t Take It with You (1938), she was also quite good in more serious roles, particularly her final turn in the seminal 1953 Western Shane. Her performance in Smith is no exception; as Clarissa, Arthur is the perfect combination of the lover and the cynic, demonstrating a tenacious spirit that lights up the screen during her scenes. Watch her face as Jeff expounds on the preciousness of liberty. You can literally see her shift from skepticism to disbelief to a dawning sense of wonder. Simple, heartfelt, marvelous. The supporting cast is equally admirable, led by Rains as the conflicted, yet determined Paine. Arnold provides one of his typically bullfrog-esque performances as the loathsome Taylor. And Harry Carey is a delight as the winking, far-seeing President of the Senate, whose quiet interference keeps Jeff on his fighting path. 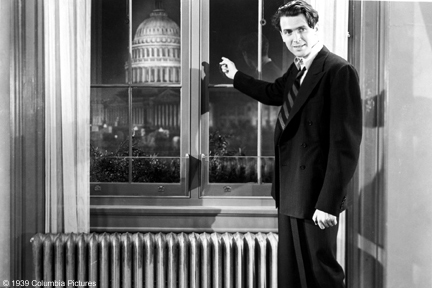 Mr. Smith Goes to Washington is airing on TCM on Wednesday (the 10th) at 9:30AM EST. If you have yet to catch this lovely slice of film history, take advantage of the opportunity to do so, and see if you’re not cheering for Jeff, too, by the end of the movie.